It might not be pool season right now since it’s the dead of winter, but we are coming up on vacation season! That hopefully means you’ll escape the cold for at least a week or so and spend some time relaxing near the water. Hanging out by the pool or ocean doesn’t have to mean going without your music, and Amazon carries a bunch of water-resistant Bluetooth speakers that’ll get the job done. 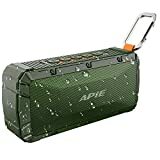 The site’s best-selling model is the APIE Portable Wireless Outdoor Bluetooth Speaker, and it’s on sale right now for just $19.99. Wireless portable bluetooth speaker: Enjoy a High Definition stereo sound with a impressive volume whether you’re lounging around the house,or partying,walking out,camping,hiking,biking. QUICK & EASY TO PAIR Our Bluetooth shower & outdoor speaker uses Bluetooth 4.1 technology, so it pairs with portable devices much more quickly than other Bluetooth speakers. Our range is 33 feet, so you can listen to your device even when it’s far away. Full, High-Definition Sound – Enjoy an impressively crystal clear sound quality and robust bass realized through dual high-performance drivers and passive subwoofer.